Halloween is almost here. Halloween inspired parties are planned around the world. Show off your best costume and have some ghoulish fun. But many people like to travel before winter sets in. Maybe you should plan a luxury spa getaway and pamper yourself. Your body will thank you. Do your body good with some Halloween inspired luxury spa treatments. As the leaves change and the days get shorter, spas across the country are turning to pumpkin, spice and everything nice. Ginger, clove and black pepper, apple, cranberry, pomegranate and pumpkin puree – all are finding their way into treatments. As a result, they invigorate like the crisp autumn air. Leave your skin with a healthy glow. Black pepper, clove and kaffir lime give Sanctuary Spa’s Bodhi Stimulating Bodhi Treatment an autumnal appeal. Located at the renowned Sanctuary on Camelback Mountain Resort & Spa in Scottsdale, Arizona, the spa begins this purifying body ritual. It includes a gentle body polish to prepare the skin for a spicy warming body mask wrap. As the spices stimulate blood vessels for better circulation, nourishes the skin and invigorates the metabolism. In addition, warm herbal poultices are gently massaged to contour and lift the facial muscles. The treatment ends with a relaxing Swedish-style massage using a blend of black pepper, clove bud and kaffir lime. As a result, these essential oils help to breakdown fatty deposits, eliminate toxins and increase lymphatic drainage. The Bodhi Stimulating Body Treatment is priced Mon. – Thurs. at $235 for 90 minutes and $300 for two hours; Fri. – Sun. at $245 for 90 minutes and $310 for two hours. · Pumpkin Spiced Cider Facial: This super-charged cocktail of pumpkin puree, antioxidants and natural acids reduces signs of aging and acne. Natural skin-nourishing sugars and the stimulating effects of ginger go to work. As a result, experience visibly smaller pores, reduced acne, diminished fine lines and wrinkles, and firmer, smoother skin texture. Priced at $99; 50 minutes. · Pumpkin Spice Body Treatment: This regenerating treatment begins with a polishing scrub of sugar infused with cranberry and pomegranate. Next, follow with a pumpkin cream mask that melts away the sugar and infuses antioxidants, nutrients, and rich hydration deep into the skin for soft, smooth results. Finally, it ends with a light massage using a stimulating cinnamon paprika moisturizer, leaving skin soft and supple and reducing visible signs of cellulite and aging. Priced at $99 for 50 min. A deluxe version of the treatment adds a 25-minute circulation-promoting massage and is priced at $150. Make reservations at 954-944-9528. The Spa at Pebble Beach is one of only 56 spas in the world to receive the 2017 Forbes Five-Star rating. 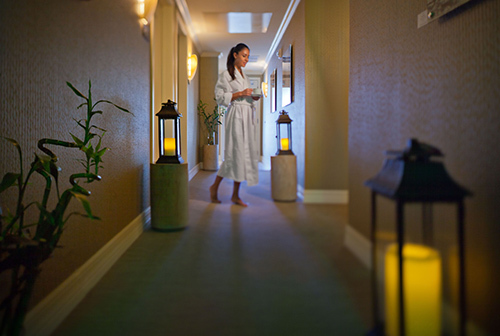 Its menu of massages, scrubs, full-body treatments, day packages and salon services complement the world-renowned Pebble Beach experience. The Pumpkin Chai scrub is priced at $270 for 75 minutes. · Muddy Pumpkin Body Wrap: This full body scrub removes dead surface cells with an application of pumpkin mud followed by a cocoon wrap. It continues with a scalp and foot massage, warm shower rinse, and an application of warm cinnamon-gingerbread oil to hydrate the body. It is priced at $99 for 50 minutes. · Muddy Pumpkin Manicure-Pedicure: A refreshing and invigorating hand and foot treatment, full of the seasonal scents of fall. Pumpkin increases blood circulation, stimulates the mind, enhances skin tone and hydrates. Priced at $99; 80 minutes. · Splendid Pumpkin Facial: Pumpkin and yogurt blend in a luxurious, antioxidant-rich facial full of natural fats and lactic acid to soothe and soften skin. Bentonite and Illite clays pull impurities, toxins and excess oils from the skin’s surface and improve blood circulation and oxygenation for a radiant glow. Priced at $99; 50 minutes. Tucked into the High Peaks of the Adirondacks in Lake Placid, New York, Whiteface Lodge is enticing fall guests into the spa with an Apple Cider Masque and Massage. This luxurious treatment rehydrates and rejuvenates skin from head to toe with mineral clays from the Canadian seas, iced cider, and apple vinegar. Lastly, a rebalancing full-body massage follows with ultra-nourishing body crème containing apple extracts. Priced at $190 Fri. – Sun. ; $180 Mon. – Thurs. ; 80 minutes. Don’t you think a Halloween inspired spa treatment sounds good. So what are you waiting for. Make your plans today and rejuvenate your body, mind and soul. Hope you enjoy these Halloween inspired spa treatments. You deserve a luxury spa experience. Contact us to plan your trip. Stop by again and read more luxury travel stories.